selfish ones by waiting for them to arrive. to be flexible with the end point). and a simple hucking drill. the last drill and teach them first to demo it to everyone else. better to just do this briefly at the start with a new, complex drill. long at the beginning leads to people switching off. join in so you can get a better feel for how things are going. should have more of the former and less of the latter. go set up the cones for the next drill! to backhand should happen after 5 minutes not 10 (generally…). development, it is better to have a few smaller games. criticism, even if you disagree with it. You trained hard for a couple of days: hitting the gym or the track. You now deserve a rest day. You are looking forward to this day to replenish your energy and be ready to hit the the gym harder or carry on the conditioning work you are doing. Here we are. You come back from work or from uni, the entire evening in front of you. Perfect moment to start that Final Fantasy games you were waiting for. A whole evening on the couch, that will be great. You snack on Doritos and chocolate milk, because you deserve it (and it is full of carbs and protein, right?). You forget the time, the game is great. When you look at the time it is midnight; you won’t have your 8 hours asleep tonight. You do your training the next day, but you don’t really feel recovered at all. In fact, you may even feel worse. What happened? Are rest days not for you? That is why I prefer to talk about recovery day instead of rest day. In the expression “recovery day”, it is clear that your mission is to recover and to get ready for the next phase of your training, a notion you don’t have when you talk about rest days. So, the question is how do you recover? Here are a couple of things to consider. Stretch and Roll. You may be quite sore after a couple of session. Here is an article about how to reduce muscle soreness for your glutes, but it can be read in a broader way. Personally, I love this stretching routine. For a summer, I was doing it every day. This one is longer, but more relaxing. You can skip the first 5-10 minutes if you don’t feel like rubbing your shoulders to produce some heat. FPTfU Coach Rob Dulabon has just released a series of Yoga routines aimed at Ultimate athletes. I will not go into details about rolling (or self-myofascial release, but there are number of resources available online. Think about working on your quads, hamstring, calves, glutes, lats. You can massage your lower back with a ball or a peanut which you can make by taping two balls together. It is quite effective. Eat well. You have you evening off, you can take time to cook some nice food and why not, some snack for the week. Don’t forget to drink water. Sometime, when we are not training, we forget that. Sleep well. You heard it thousand of times. You need to sleep to recover. You need to sleep to learn. You need to sleep to be happy. Go to bed. Now! Forget all of the above. Sometimes, more than your body, it is your head that needs a rest. Go out, have a pint, forget about training, and about ultimate. Have a nice recovery day! Disclaimer: I have no formal education in exercise science or related fields. What I’m laying out in this article is what I have learnt over the past few years from various sources (particularly Tim Morrill) and I think it will be helpful for the semi-serious ultimate athlete who is interested but doesn’t want to spend days diving deep into the subject. A lot of details have intentionally been omitted in favour of a shorter and more straightforward exposition. I strongly encourage you to not listen to me parroting back what I’ve heard – go out there and do your own research and put it into practice. FPTfU stands for Functional Performance Training for Ultimate. Ultimate is a very complex sport that places unique demands on the athlete’s body and hence requires careful and sport-specific training. I want to give a concise introduction as to what the ideal physical preparation for an ultimate player looks like. It has to be noted that since there is very little money in ultimate (practically none prior to the advent of the American Pro leagues) and because it is a relatively young sport, there has been almost no scientific research into what the best training for ultimate actually looks like. Most of what is taught today comes from experience in other sports and anecdotal evidence. There are, however, a handful of Strength&Conditioning coaches that have dedicated their time and knowledge to creating and teaching content about FPTfU (see Appendix). As this is a brief introduction, I will not talk about injury prevention, periodization, particular workout routines or nutrition in this article, even though they all go hand-in-hand with FPTfU. 2. What is FPTfU not? Even though running is a key part of ultimate, we should not be aiming to run a marathon. Even though a strong core is vital, we should not do six-pack abs routines. Even though strength training is essential to FPTfU, we should not be working on our biceps and chest. Instead, we should try to understand the goals, methods and differences between other training methods and learn from them. In a nutshell, to get better at jumping and (ultimate-specific) running, we need to train for explosiveness and repeated, short bouts of energy. A complete training program for ultimate athletes addresses this in three parts: Strength, Agility and Conditioning. How? High intensity interval training, with work periods usually between 20-60 seconds, rarely more than that. Melissa Witmer’s 6-week program covers the Agility and Conditioning aspects (there’s no harm in doing it for more than six weeks) and you should learn plenty about these two aspects by just doing it. But it has to be complemented by a strength training regimen, both to reduce injury risk and to simply get more out of it. If you do not have the time, money or motivation to lift at a gym, you can still make some progress in this regard (especially if you haven’t done any strength training before) only using bodyweight exercises. Tim Morill has a great video about just that. Practice until you master the skater squat. An internet search will probably recommend weightlifting routines based around the Squat, Deadlift and Bench Press (the three movements used in Powerlifting), which seem well-suited for beginners because the workouts are simple and progress can be measured easily. However, the three lifts are commonly done incorrectly and may even be bad for an ultimate player’s asymmetry-plagued body, as they do not address imbalances and can even exacerbate them, leading to injuries and chronic pain. An instructor at your gym will likely suggest a bodybuilding/weight-loss routine, which again is not what we are looking for as ultimate athletes. The student squads do one strength session together every week at the CUSC. Our workouts have been designed with the demands of ultimate in mind (and also being beginner-friendly): after movement prep and warm-up, we do some plyometric exercises, then we have three circuits of three exercises, each circuit consisting of a uni-lateral lower-body exercise, a uni-lateral upper body exercise and a functional core exercise. Melissa Witmer’s Ultimate Athlete Project provides a complete 12-month protocol, where all three aspects are designed to work together. GB Mixed has been using the UAP for the past two years. Tim Morrill is about to launch his new website where you will be able to sign-up to get access to his program ‘MP-FPT’. They are the big three that have been involved the longest and that share the Training Blog column on Skyd. You stand on the line, looking about you. The captain is calling the plan, but you can’t focus. The blood pounds about your ears as you start your run up. The disc goes up, and as a unit of seven you surge off the line towards the opposition, with the deafening cries of your team mates all about you. It’s sudden death, and it’s time for you to step up and make that play. The opposition get the disc moving, the reset handler catches the disc in a power position and your man makes his move deep. You both hurtle after the disc, the up call echoing across the field. He has the step on you; you know you need to produce something special. The disc curves in, and you make your move. You hurl yourself across behind the back of your man, fingers outstretched, and tip the disc out of bounds. The crowd goes wild; you calmly get up and go to your offensive position. Now it’s time to go win the game. And then you snap out of the daydream. I don’t know about you, but those sorts of day dreams are ones that I have regularly, usually when I haven’t played ultimate for a while, when a tournament is around the corner, or when I’ve just decided that this time, I’m gonna work really hard on my athletic development, and this time it is going to be different. That time frame usually lasts about two weeks. I personally really struggle to stay motivated for long periods of time. I do enough to get by, but I know full well that it holds me back. It frustrates me, but I just don’t seem to be able to get past it. So I thought I would do a bit of research and share the wealth on how I aim to success over these 6 week weeks. Motivation, simply defined, is the ability to initiate and persist at a task. To perform your best, you must want to begin the process of developing as an athlete and you must be willing to maintain your efforts until you have achieved your goals. Motivation in sports is so important because you must be willing to work hard in the face of fatigue, boredom, pain, and the desire to do other things. Eventually, during this 6 week period, you will arrive at a point where it is no longer fun. I can in fact think of various moments you will have to overcome. That first session when the weather is disgusting. That first time you get home and you are really tired, or in a bad mood and just want to chill. After a few weeks, you will be at that stage where you think… Well it’s gone quite well, missing one day won’t hurt. That’s when you are at the stage where you have to make a decision- to grind or not to grind. You can think about your motivations in regard to the 3 D’s. Firstly, you need to think about the direction you want to go. Do you want to get to the top of the game nationally? Are you happy with just carrying on at your current rate? Are you at that stage where you are happy with where you have got to, and no longer wish to push yourself? Any of these are possible, it depends entirely on you. You then need to make a decision, the second D. If you are doing CgF, it’s likely you have decided you really want to push yourself. Having made your decision, it’s now time for the 3rd D, dedication. If you made the decision to be the best you can be, now is the time to dedicate yourself to it. – To do some form of proper workout (such as training, gym, conditioning or playing) at least 30 of the 42 days over the 6 week period. – To restrict myself to an unhealthy snack only twice in a week. – Follow Melissa Witmer’s 6-week program. – Make sure I keep posting in the Facebook group and helping people discuss their workouts and how they get on. Being motivated will see you persist in reaching your goals. In order to achieve these goals, you need to break them down into smaller, more manageable and focused goals. Make sure you share them. If it helps, I am more than happy for you to email me, telling me your goals, and keep me up to date with them. Complete your workoutlogthing and post on the facebook group; a united effort will see far greater success. I really hope that you are successful over the course of these 6 weeks in meeting your goals. Whatever motivates you, be it inspirational videos, ultimate clips, group workouts, competition against others… do whatever you need to do to deliver on that promise to yourself. I thought I’d just finish with a joke I heard recently. You, silly. Being called as a first cut (i.e. the initial primary option for the offence once a handler has the disc in his/her hands) puts you centre-stage. This is both a blessing and a curse, but I’ll argue it’s mainly the former. Yes, there’s a bit of added pressure now to get the offence moving, but not necessarily to get the disc. A great first cut, particularly from open play (i.e. not a bricked pull), may never see you get the disc in your hands but instead drag more than your fair share of defenders with you in the (possibly mistaken) belief that you’re a dangerous threat. This can then provide easy space for others to use. In 99% of cases however, you’re still cutting with the intent to receive. I’d argue that being a first cut is one of the easiest jobs in most offensive systems. Rarely will you find yourself in a position where everyone on your team gives you the maximum available space and time to work with, and where your defender is often starting from a poor defensive position. Many argue that ultimate is heavily biased towards the offence – even if the opposition know exactly the string you’ve called, it doesn’t necessarily help them much – and the first cut can be one clear illustration of this. As a first cut, you’ll often have a huge advantage before you’ve done anything; embrace this advantage. The first cut is there to provide a kick start for the offence – you’re the first gear. There’s no easier way to ensure the offence gets going than maximising the available space for one isolated cutter to receive the disc. This requires devoting at least a few seconds to one specific player as the primary look. It turns out cutting is a lot easier without your scumbag teammates getting in your way. It also makes the first throw a lot easier for the handler – they know right from the beginning who they’re looking to move the disc to, and when to expect the development of your cut. First of all, the general rules of cutting apply. Where possible, ensure deep movement is more parallel to the pitch, and all under movement comes at an angle which provides enough time and lane space for the thrower to deliver the pass. I’d recommend this article from Benji for a lesson in effective cutting shapes. Most of what I talk about assumes you’re working out of a vertical stack or a system which looks to isolate, as opposed to a more fluid horizontal offence where multiple options open and close quite quickly. Threaten both the deep and under space, using what you are given by the defence to your advantage. This might depend on the distance and timing of the pull, as well as how quickly the defence chases it down. Often, a first cut will look to set up a solid ‘fake’ deep cut to earn the respect of the defence, before using the created space underneath to make good yards up the field. However, the deep cut should ideally be a legitimate option. If the opposition runs down the pull like David Dickinson chasing a hard bargain, and your fellow teammates have provided a nice shallow stack to cut alongside, feel free to take the deep shot on right away. Watch how easily Will Driscoll does this against Oregon below. And now it’s Jimmy Mickle’s turn. Where you cut is often dependent on the setup of the disc and the stack. If you’re running a side stack for example, you’re afforded a lot of lateral space, allowing you to throw some wider shapes than you might otherwise be able to. The clip below shows Max Thorne coming out of a side stack for Pitt and using the width of the pitch to great effect, before unleashing a dime to Trent Dillon. (Be sure to watch it a second, third and umpteenth time to see the Georgia defender get absolutely #rekt by that second cut from Dillon). If your handler is being trapped sideline from a dead disc, lateral space is suddenly at a premium. Therefore, sharper turns and using the depth of the pitch become more crucial components to your cut. You could even start very shallow (i.e. close to the handler) and threaten the instant lead pass down the line. If the disc is in the middle of the pitch with the defence set, you could choose to battle your defender to the open side. Alternatively, you could attack the break side early from a position near the back of the stack, especially if you know the handler is a Dathan or Wong type who will be happy to take that shot on. One top tip: don’t be afraid to clearly set yourself up before you start your cutting shapes. Step outside of the stack if you need to and occupy the space you’d like to cut within. Put your balls sur la table and make yourself known: create the obvious isolation. The defence still has a difficult job and it helps to avoid picks and other players getting in your way. The example below shows Chris Kocher doing exactly this. Okay, so you’ve figured out you’re first cut, why you’re doing it, and you’ve sussed out some options for where on the pitch you should be attacking. How do you actually do it? We’re now going from the macro to the micro. I could spend a lot of time talking about specific mechanics or how cutting works more generally, but there are better places you can go for this. I’m not usually a massive fan, but Ultimate Rob’s ‘Mastering the art of cutting in ultimate’ is a pretty solid outline of general cutting principles in ultimate. Benji’s post on getting separation is also a good read. I’m a big fan of attacking the defender. Watch in the clip below (and the one of Max Thorne above) to see a good example of being aggressive in forcing your defender to adjust. Tyler Degirolamo cuts right towards his man and uses his body to shield off the space he’s then going to cut into. Dictate with your steps and drag your defender to a position where they can less effectively defend your subsequent move. This is also a good example of primary cutting within a horizontal offence. One big rule for me is always finish the cut. This is extremely important. If you find yourself coming up against a poach, battle through and complete the mission. Remember, being the first gear of the offence doesn’t necessarily mean getting the disc – if you disrupt the defence and create space for others to use or make a break swing to the middle easier, that’s an effective first cut. Don’t be the guy who’s always pulling out early (are we still doing phrasing?). Satisfy that thrower by continuing to threaten somewhere and move the defensive structure. If you don’t, you’ll confuse the handler and leave your offence with zero developing options on a now rapidly progressing stall count. Even if the defence comes down in a zone, you may well be able to produce an effective attacking movement with a ‘standard’ first cut option. The majority of strong (first) cuts will usually involve one or two sharp changes of direction as opposed to multiple fakes. It’s really unnecessary to be dancing or juking around when you’ve been given so much space in the absence of other players. The footwork and mechanics of cutting technique are very well demonstrated by NFL receivers and explained by Tim Morrill. I’m a big fan of his videos outlining the jab step and the getaway step. Although aimed at junior coaches, Ben Wiggins provides an excellent tutorial in establishing foundations for good footwork in this video. Have a look below at Tim Morrissey absolutely roasting Trent (a very good defender) with quick changes of direction: look to emulate these sharp turns in your own first cuts. Being the first cut actually just about removes one of the main difficulties in being a better cutter: timing. Continuation cutting in flow is a very challenging aspect to get right. However, as a first cut operating from the pull in open play, or from a static start at the brick or after a turn, your life is a lot easier. Generally speaking, I’d suggest aiming to achieve maximum separation from your defender (often occurring in the moments immediately following a change of direction) fairly soon after the thrower has turned to look upfield. A standard pull play will look for one handler pass before moving to the first cut, so there really aren’t too many variables involved in your decision making. If in flow, I’d argue that it’s better to arrive later than to arrive too early. It’s easy to move too much initially and close off a throwing lane before the thrower is looking for you. If cutting from static, a reasonable suggestion is to initiate your movement on stall -1, but this is quite context dependent. In the example below, see how Mike Caldwell times his initial movement under well, only to realise an errant handler pass has thrown off the timing. However, he adjusts well and recovers to provide a solid offensive option, albeit one slightly shallower and closer to the sideline than originally desired. First cut might actually be the easiest gig you’ll ever get. A good first cut doesn’t necessarily mean always ending up with the disc in your hands. Threaten both the deep and under space, ensuring each movement is a legitimate option. Don’t be afraid to set yourself up and create an obvious isolation. Attack the defender, be aggressive and use your body to create space. Finish the cut: complete the mission. Stick with one or two sharp changes of direction: no dancing allowed. Arriving later than planned is better than arriving too early. Hopefully this is useful for some of you. I’d love to hear your comments, and shout if you have any questions. Our sport is played on a huge variety of surfaces, and choice in footwear on each has a significant impact on performance and safety. Here are my thoughts on optimal shoes for each surface. Firstly, it’s not necessary to have absolutely every single type of shoe at your disposal. Some are incompatible with certain surfaces, but some are more flexible than others. There are some surfaces you may never even set foot on. What you can expect from your shoes: you probably won’t get more than 1-1.5 seasons out of any shoe you play in regularly, regardless of quality and cost (indoor shoes and shoes used in the dry may last a fair bit longer). For that reason, I’m pretty resistant to spending more than around £50 on a pair. That said, I’d also think twice about spending less than around £25- boots that price tend to be made of poor materials, the studs either drop out or stick into your feet, the sole can deform quite easily and change the amount of support they give your feet. You’ve got three options here. Many people make do with normal trainers, because it doesn’t seem worth buying extra footwear for a very short season. They’re not great, but not terrible. 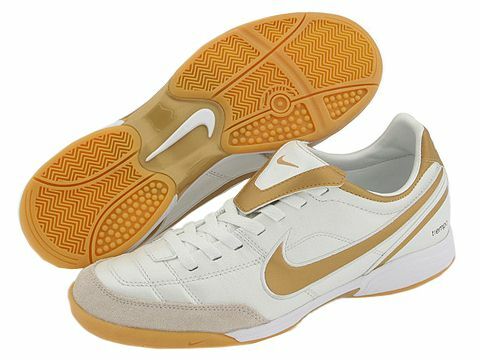 A slightly better option is court shoes, as used for badminton and squash. They are at least designed for indoor sports. Far and away the best option for indoor play is basketball shoes. They’re designed for exactly the short sprints, hard turns and jumps that you make in ultimate. In my opinion, the mid-ankle ones are best. High-ankle support sounds great, but any rolling which can’t happen in your ankles gets sent straight to your knees, which are a lot harder to fix – it’s better to roll an ankle than bust a knee ligament. Once again, trainers are just about acceptable. I mean, they won’t get you thrown out of the venue, and aren’t going to kill you, but you’ll be sliding around quite a lot. Better are astroturf shoes. The commonest type have lots of small rubber knobbles, and are OK. Of that type, slightly more aggressive knobbles are better – I have found that Nikes tend to wear down very quickly. The best astroturf shoes I’ve seen are the hockey shoes made by Asics, specifically in the Blackheath and MP ranges. They also stand up very well to use on 3G astro, and on hard, firm and even moderate ground (although they’re not good if the grass itself is wet). An honourable mention here should be made for TD-style american football cleats (more on these later). They give an absurd level of traction, but some argue that that degree of sticking is actually bad for your knees; they’re also absolutely on the limit of what some venues may or may not allow (often they ban aggressive studs to protect the surface). I would really avoid wearing other hard-studded shoes and especially blades, which have no shock absorption and raise your heel quite a long way above the turf. 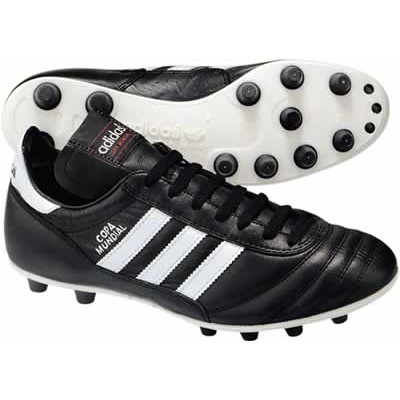 Firm Ground moulded football boots, like the Adidas Copa Mundials shown here. These tend to have more studs than normal football boots, made of plastic or rubber, but on a solid footplate. These are better than knobbly astros, and probably about the same if a little less comfortable than the Asics. Sidenote: some football clubs have banned the use of blades for safety reasons, and there are rumours that they can cause knee issues as they get ‘stuck’ in the turf. Your mileage may vary. 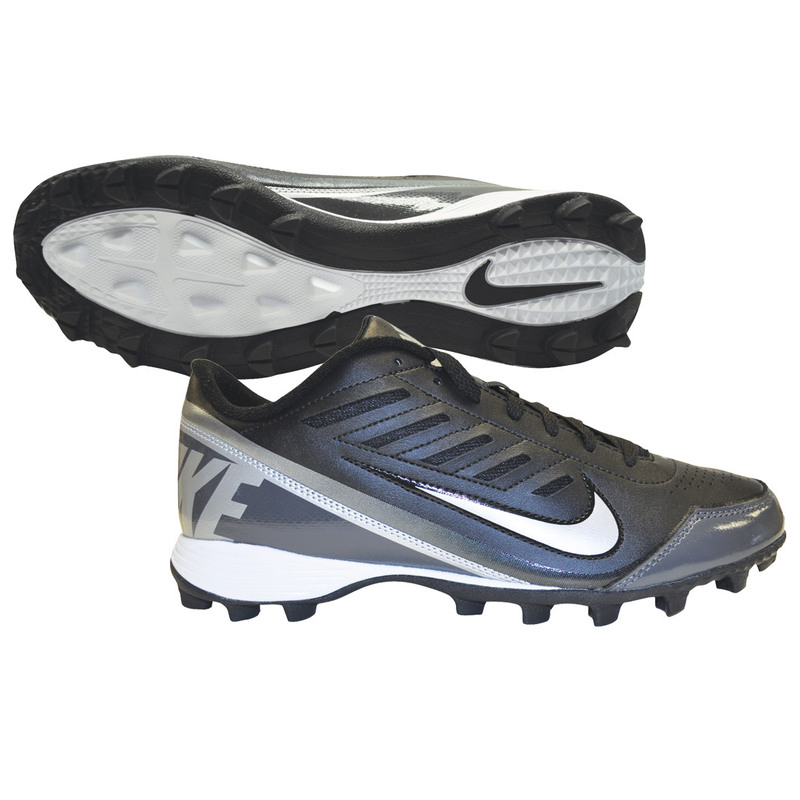 The optimal shoe for this surface is the wide receiver cleat, like the Nike Speed TDs pictured here. Designed for exactly the movements we want, on exactly this surface. The toe cleat actually makes a surprising difference to sprinting and pivoting. Good luck getting them in this country, though! On actually hard ground, I find even FG boots like the Copa Mundials to be quite uncomfortable. So long as the ground is dry, the best performance can probably be had from the Asics above. However, if there’s even just some dew on the ground (as is common on Sunday mornings) you’re better off in TD-style cleats. Some people find TDs uncomfortable on hard ground, but they’re certainly much better and more comfortable than most FG shoes. Absolutely a vote for the TDs again here. But the Asics will do pretty well, as will most FG boots and blades (if you don’t believe the anti-hype). The Asics tend to lose their edge here, and some FG boots (in particular, blades) will not be much cop when it comes to starting and stopping. Many FG boots will contine to do well, as will the TDs. Hybrid cleats like the Adidas F50 SGs are a very good option here. Their cleat pattern means they’re pretty comfortable, but they’ve got the slightly longer metal studs to take care of any more muddy patches as well. The AdiZeros are absurdly light, as well, but don’t last that long and it doesn’t make much difference if it’s muddy. I prefer the Predator XT SGs, a rugby boot based on the F50 – very comfortable, lasts longer, and great value. Otherwise, normal 6-stud soccer cleats will be fine. And finally, garden-variety soccer cleats find their peak. They tend to be pretty cheap and plentiful and behave well in these conditions. Just make sure you screw the studs in tight before the first few times you use them! In an ideal world, we’d use these instead of SG soccer boots. 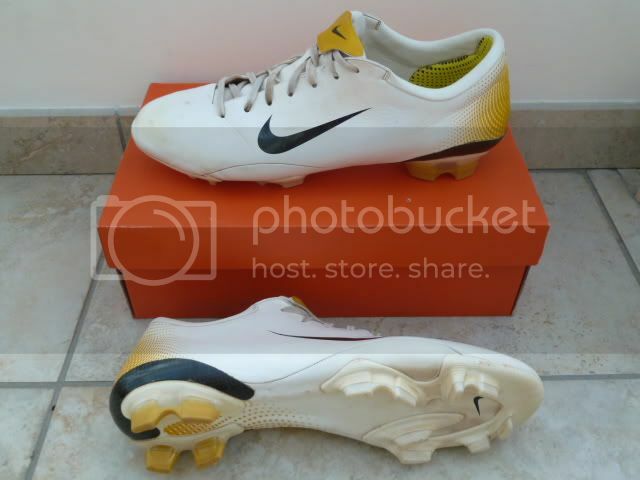 Very similar cleat pattern, but generally better built and with the toe stud. I still like my hybrids here. SG boots will achieve something here and you may be entirely happy with them (I still like my hybrids in these conditions, but the optimal footwear is a proper 8-stud rugby boot. Note: strictly speaking, any boot with exposed metal is considered dangerous equipment and not allowed. However, that knocks out literally every SG boot you can buy in this country, and I’ve never seen this ruling enforced in the UK or Europe. Rugby boots are very aggressive and coming down hard on someone with them isn’t going to be pleasant, so minimise their use to when it’s really bad out, if at all. For the sake of completeness. Some people swear by sand-socks, but I can’t see that being very pleasant and have never had any issues with the foot-wear that a lot of beach players complain about. I would not recommend minimalist shoes like FiveFingers – even the ‘Keeps Stuff Out’ variant picks up sand like nobody’s business. Go barefoot! Sandsocks may be helpful on more shingly beaches, though.